While Google Plus and Google Chat never really caught on, Google is still the largest and most widely searched database, by a very large margin. When someone looks something up, they Google it. So, if you have a business and someone is looking you up, you are getting Googled. This makes the importance of having good reviews on Google mandatory. But just as essential as having a plethora of good reviews, is how you respond to the bad ones. This adage rings true on Google. But I would argue to keep your friends and enemies at the same proximity, which is, very close. Some people are tempted to only respond to their positive Google Reviews, thanking them for being loyal customers. However, much of businesses respond only to negative Google reviews. For perspective, if someone walked into your physical store and said they loved it, would you just ignore them? NO! You thank them and give them just as much face time as the person complaining about your store because deep down they are unhappy people and complain about everything. 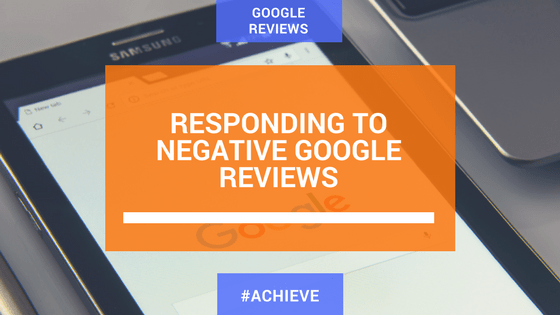 You must respond to every positive and every negative review. And it must be a genuine response. If someone sees that you copy pasted or used an autoresponder, it can be demeaning. It will make a happy customer think twice about your company, and will enrage an already unhappy customer. 1) Verify and validate that they had that experience. 2) Explain how this is unusual for your company. 3) Offer a discount or freebie for a chance to win them back. If they do come back – congratulations! Now you have changed an unhappy customer into a happy customer. Even if they don’t come back, you look good on google. People want to know that your business is engaged. They want to see that a company is responsive. Responding to Google reviews shows that you are active and that you care about your customers. When people look around for products and services, they want social proof. They want to see that other people have done this before, and that it has worked out well for them. That’s why people read real customer reviews. It influences their purchasing behavior. If they see that one product or service is clearly better than another, they will buy the better product, or hire the better service. But people are also very smart. They know that some companies buy fake reviews. They look for genuine reviews that are believable. They also want to know that a company will take the time to listen to them, and respond when there are problems. This is a free opportunity to display what your company is capable of. Will you ignore the audience you are trying to build? Or will you engage with them?